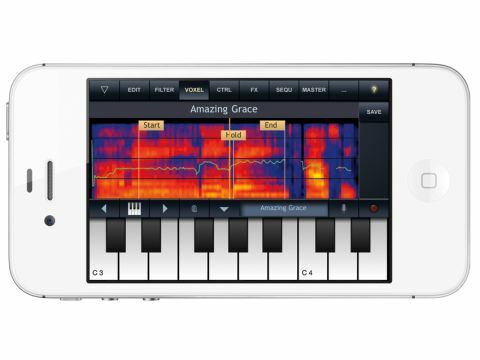 If you're at all into vocoding and/or resynthesis, this is one app that definitely needs to be on your iOS device. Inventive voxel sequencing and traditional vocoding capabilities. Essentially a streamlined vocoder, synthesiser and sequencer, iVoxel is built on the technology behind VirSyn's powerful Matrix vocoder plug-in and intended as both a serious studio tool and a freaky live performance device. iVoxel resynthesises the input or imported audio signal and converts it to 'voxels' - segments of sound that can be manipulated to a deeper extent than straight-up samples. Although it's more than capable of 'traditional' vocoding via live input (sing into your headset mic, play the onscreen keyboard and mess around with the vocoder parameters and effects), the real draw of iVoxel is its ability to sequence voxels into usable vocal lines. About 300 single-word and short-phrase voxels come built-in, and you can also record/import your own. Voxels can be assigned across the whole keyboard or in key groups, and interesting (if decidedly electronic-sounding) vocal melodies can be programmed with ease using the onboard sequencer, and then exported to your desktop DAW. The Voxel editor enables you to set the playback Start, End and Hold positions of each voxel, and pull the pitch up and down in real time. It's all quite weird but splendidly 'Berlin', if you get our drift. iVoxel is also MIDI- and WIST-compatible, so using it with external gear and other iOS apps is as catered for as Apple currently allow. The only negatives are that the interface can be a bit confusing, and that iVoxel does have a very definite sound of its own - great though that sound is.